Wine: Is it really a toast to good health, and a healthy heart? You may have seen recent articles in the media such as this that seem to contradict the notion that regular wine intake can be heart healthy. So this may be a good time to explore the link between wine intake and heart disease in more detail. For several decades, we have known that certain populations in the world, such as France, seems to have less heart disease despite a higher intake of saturated fats. 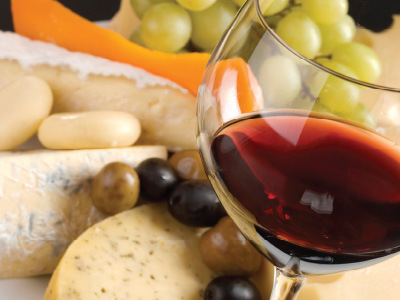 One explanation for this finding (referred to as the “French paradox”) was the high intake of red wine in these populations, leading to speculation that red wine could somehow prevent heart disease. In fact, many studies have shown that so-called “moderate” alcoholic intake (one drink a day for women, or 2 or less for men) seems to lead to less chronic disease and a longer life span than those who drink heavily, or not at all. Of course these are only observational (e.g. not randomized) studies, so there is always controversy about whether other factors could also play a role. Although wine contains many heart-protective antioxidants, the agent which was postulated to be particularly protective is resveratrol, as animal studies have shown that high doses of this antioxidant can prevent chronic disease. Although the studies were not really applicable to humans (due to extremely high doses of resveratrol), this led to the widespread notion that red wine is particularly “heart healthy”. Unfortunately, no other studies have been able to show that any particular agent in red wine makes it superior to other types of alcohol in the prevention of chronic disease. The new study released last week confirms this, as these researchers measured the amount of resveratrol in elderly Spaniards, to confirm their consumption of red wine. They found no relationship between wine consumption and longevity, heart disease, or cancer. 1. Moderate alcohol use, as defined above, does seem to have a protective effect against chronic disease and increased longevity, compared to heavy drinkers or nondrinkers. 2. However, no specific type of alcohol, including wine, has clearly been shown to be superior in terms of its protective effect. Certainly, wine (red or white), with less alcohol and more antioxidants then other types of alcohol, would seem to be a reasonable choice for those who choose to drink alcohol. 3. Because the protective effect of alcohol has not been shown conclusively, there is not enough evidence to recommend that someone initiate regular alcohol use simply for the health benefits. Other lifestyle issues, such as a healthy diet, regular exercise, and weight maintenance are far more important. 4. In very detailed studies, there does not seem to be any specific elevated risk associated with mild or moderate alcohol use. Therefore those of us who incorporate alcohol into our lifestyle should focus on the quantity we drink, and making it part of a overall healthy lifestyle. 5. Increasing use beyond “moderate” can clearly increase the risk of complications and chronic illness. So if you decide to incorporate alcohol into your lifestyle, do so for your enjoyment, not necessarily for your health – and always in moderation! And for more specific advice, check with your doctor. New York Times summary of recent research. Link to “Top Myths about Heart Disease” , interview with Dr. Steve Nissen from the Cleveland Clinic. This entry was posted in diet and tagged alcohol, diet, heart disease, heart health, Nutrition, prevention, wine on May 21, 2014 by The HeartHealth Doctors.